March 9, 1930 Ornette Coleman, jazz saxophonist, trumpeter and composer, was born in Fort Worth, Texas. In 1959, he released “The Shape of Jazz to Come” which critics hailed “a watershed event in the genesis of avant-garde jazz.” In 1960, Coleman recorded “Free Jazz: A Collective Improvisation” which at 40 minutes was the longest recorded continuous jazz performance to date. Coleman was inducted into the Down Beat Jazz Hall of Fame in 1969 and in 1984 was designated a NEA Jazz Master, the highest honor the United States bestows on a jazz musician, by the National Endowment for the Arts. In 2004, Coleman was awarded The Dorothy and Lillian Gish Prize, given annually to “a man or woman who has made an outstanding contribution to the beauty of the world and to mankind’s enjoyment and understanding of life.” In 2006, Coleman released “Sound Grammar” which won the 2007 Pulitzer Prize for Music. In 2007, he received a Grammy Lifetime Achievement Award and in 2010 he was awarded an honorary doctorate in music by the University of Michigan. 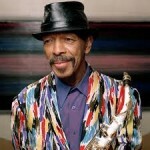 Coleman’s biography, “Ornette Coleman: A Harmolodic Life,” was published in 1992.